This structure is the oldest building in La Grange. Constructed of adobe bricks, it is a representative example of a distinctive architectural technology practiced by the Spanish pre-1850 and by some of the first Californians. The slightly raised slate foundation is also typical of building practices of this period. Evidently the rectangular adobe structure was used by La Grange as a post office during the community's early history. It may have been built with this civic function in mind during the early 1850's or, more likely, it was adapted for this use during the gold rush years. 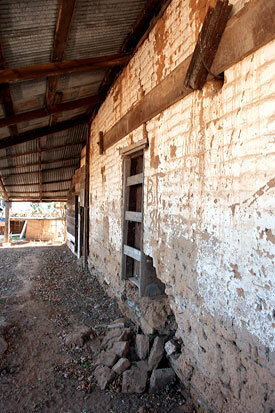 The building may have originally been a residence or ranch outbuilding. Excerpted from the NRHP nomination dated 28 February 1979. 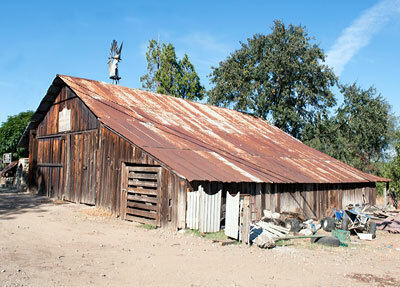 For another view of the Old Adobe Barn, see California Historical Landmark #414.